Big School News: Senior Class Science, Experiments & Projects! 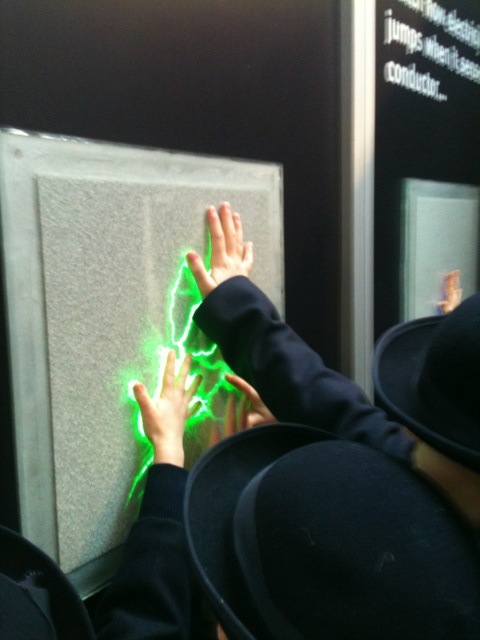 "Hands On Learning" at the Young Scientist Expo. In the last post we talked about the essential aspect of “hands on” learning style to the Montessori method, this runs the whole way through the primary system from 2-12. In our primary senior class the ladies have taken “hands on” to a whole new level. 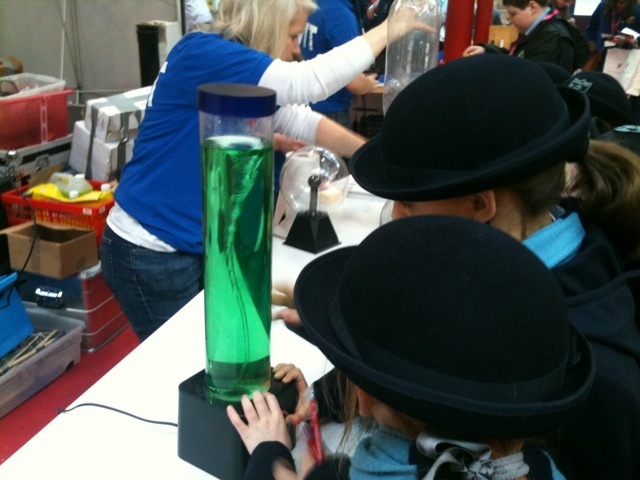 In January the class took a trip to the RDS to see the stands and projects at the Young Scientist Expo. This proved to be a great success and in the words of the three oldest class members “it was really cool”. The school stands themselves, the fighting robots and the floor piano being particular hits. 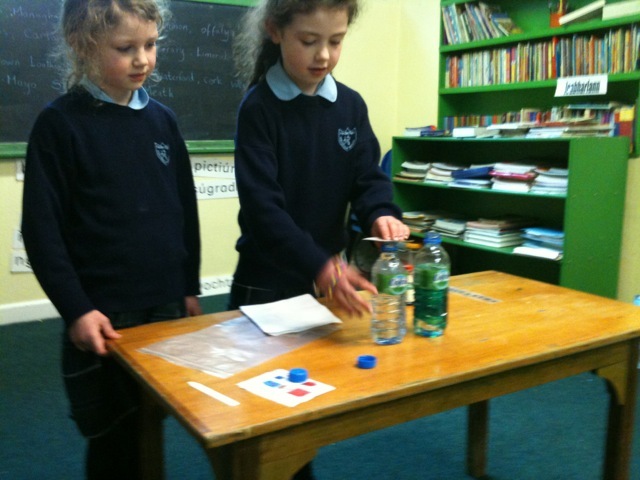 With all this inspiration under their bowler hats they returned to school to research and present their own science experiments to the class. Each girl researched a different experiment using the science resources in our library and on the internet then they practised at home. 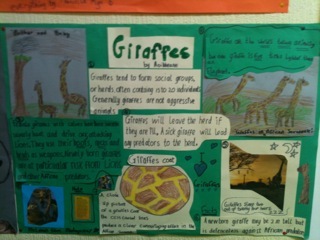 The next day they set up their chosen experiments to present to the rest of the class. 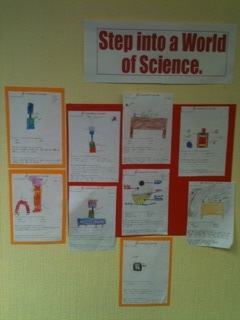 Our Experiments recorded on paper. The presentations included combining bread soda & vinegar to inflate a balloon, creating a sunset from milk, water & a torch, showing how hot water travels from a hot place to a cold place, and proving that Co2 is denser than O2. This was the first step in the overall introduction to project work and presentation that the children of the senior class carry out throughout the spring term. Fizzy Lizzy in full flow! Of course individual projects are great fun, but nothing beats a class project, especially one that makes a big mess and has your teacher right in the middle of it. 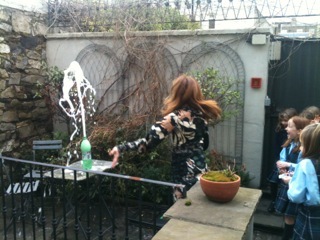 In a new take on the “Cocoa Cola Rocket” the class called this project “Fizzy Lizzy blows her top!” They took mint sweets and combined with 7up in a litre bottle. The aspartame in 7up combined with the gelatine from the sweets lowers the surface tension in the liquid and encourages bubbles of CO2 to grow exponentially, shooting out of the neck of the bottle to produce a fountain! 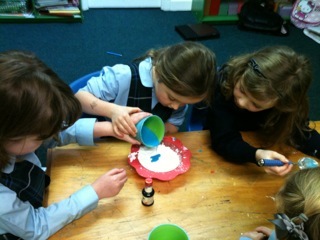 The class also tried their hand at making “goop”; combining cornflour, water and food colouring they made their goop, and then began to explore its properties. On a microscopic level, the corn flour goop consists of small starch particles packed close together. Separating the particles is a thin layer of water that acts like grease – allowing the particles to slide across each other and move around, as long as they move slowly. 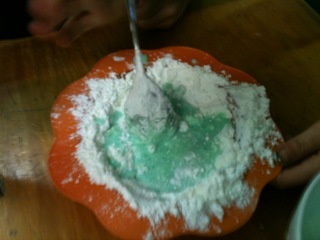 So, when you slowly push your fingers into the goop, the starch slides out of the way, allowing you to slide in easily. However, if you try to push your hand in quickly, the starch tries to move faster than the water can accommodate and grains come into contact. Now, the much stronger force of static friction acts between the grains – as long as they are being pushed together, there is force preventing them from sliding across each other – and the harder they are pushed together, the stronger the friction force is! This is something like Roman arches that hold together without mortar. Gravity pushing down on the archway causes friction between the heavy stone blocks that stops them from sliding across each other and collapsing. In the case of our corn flour goop, the structure is random and “self-assembled”, occurring when there is a very high concentration of starch granules leaving only a small volume for the lubricating water to fill. 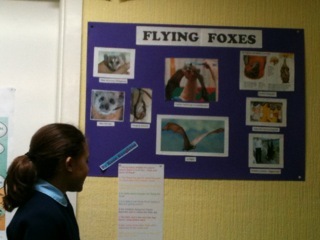 All of the researching and presenting skills the students gained in the science experiments are composited in the presentation of the self-selected Nature Projects. 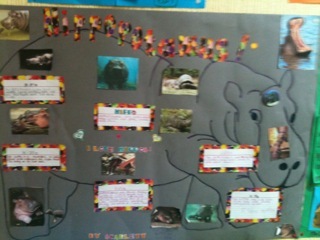 As our Directress Ashley informed me “Individual project work encourages the student to investigate varied subjects with great depth, promoting general reading, research and creativity in the child. The responsibility associated with completing their projects gives the students confidence in their own work and abilities.” Researching their projects from the wide variety of sources available from books on the topic, encyclopaedia and the internet the children learn to rate and compile sources and the information they contain. Project work is the foundation for self-teaching in the senior cycle, learning the skills of time management, choosing relevant research sources, logical information compilation, and concise presentation of the facts will all be invaluable to the student in their further studies and in the eventual work environment. It is no coincidence that the Google founders Larry Page and Sergey Brin were Montessori educated, founding a business based on well researched individual work that merges to a larger project undertaken with cooperation and responsibility. Another class trip was the stimulus of the natural world projects, this time to a resource right on our doorstep, the Natural History Museum. 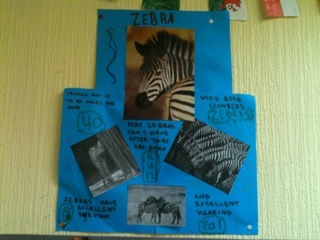 The girls selected an animal that inspired or interested them and the research began. I found it refreshing to note that while the internet was available to all students they did not rely solely on it, displaying a vigorous use of books as a resource also. If you are interested in learning more, I know that the ladies of the senior class would be delighted to show you around their room where their projects are on display. Big School Mooos! 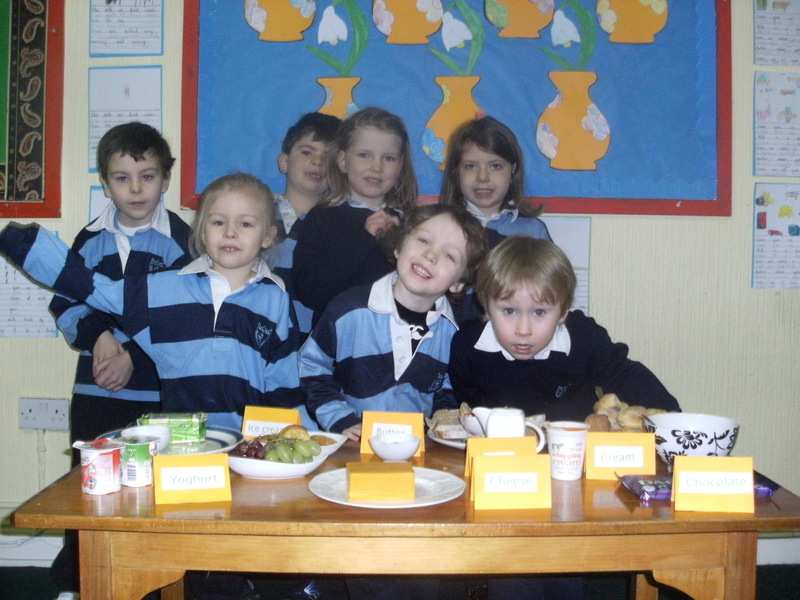 Senior Infants Dairy Tasting. Who says learning can’t be tasty and fun? Not our Senior Infant class, that’s for sure. Any class that involves tasting cream, cheese, chocolate, home-made scones and ice-cream is sure to remain in the minds for a long time. Discussing the food before tucking in! Modern teaching practices extol the virtue and indeed necessity of hands on tactile experiences to the young learner, but it was Maria Montessori at the turn of the last century who recognised involvement of the senses as the essential learning tool of the child. Throughout the Montessori curriculum we see the engagement and refinement of the child’s senses to organise and classify the world around them. Beginning with the sensorial materials, the child’s senses are honed to distinguish fine variations in texture, weight, length, width, temperature, colour, sound and taste. Once these foundation blocks are in place the child can use them to frame their learning in all areas. 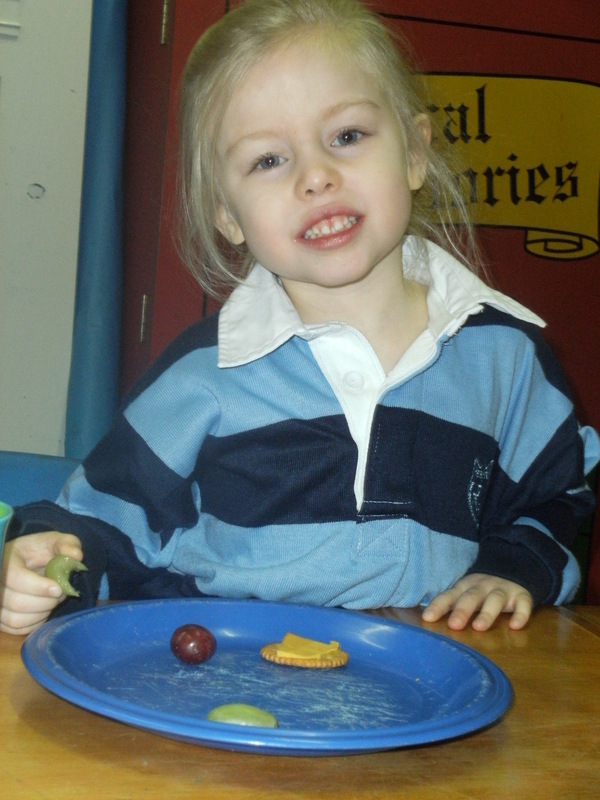 The “sensorial” learning style is evident in maths, language, culture and science. 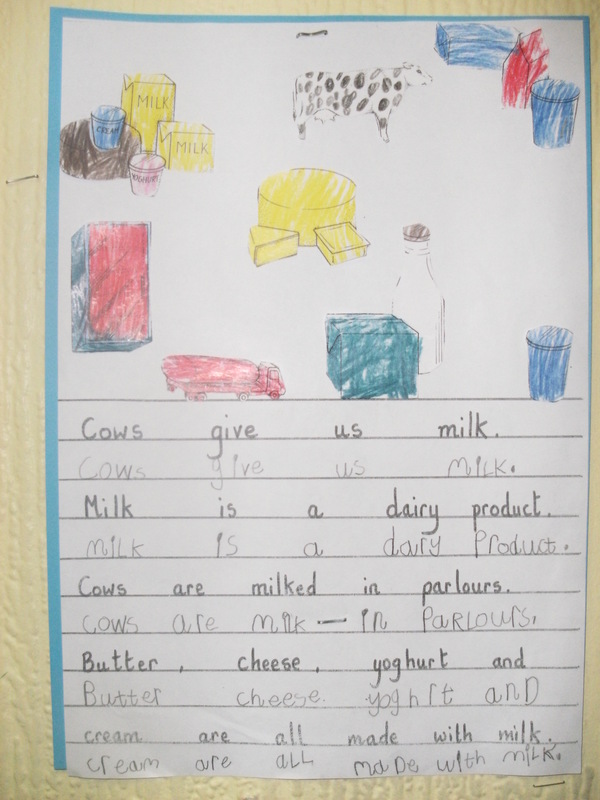 Our Senior Infants embarked on a project to discover the place of dairy products in our diet. 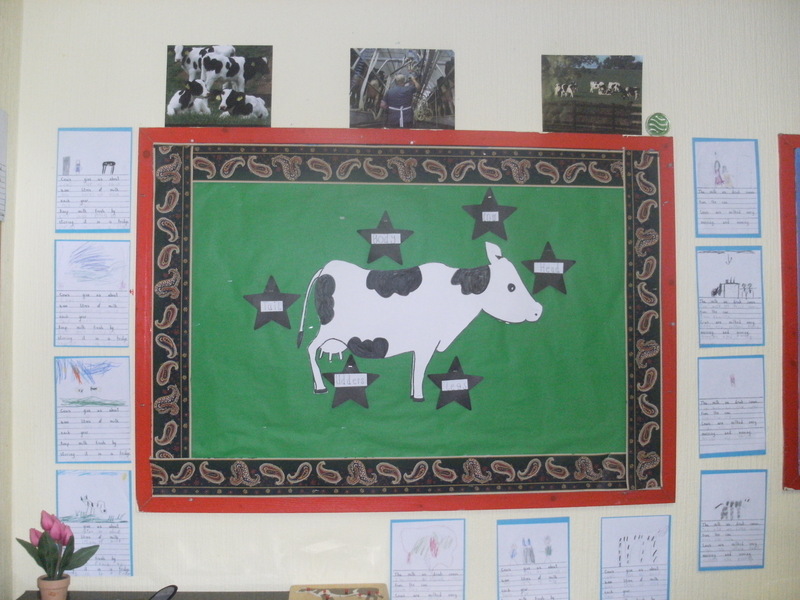 Beginning with a study on the dairy cow, they labelled the parts of the cow and created a wall display. 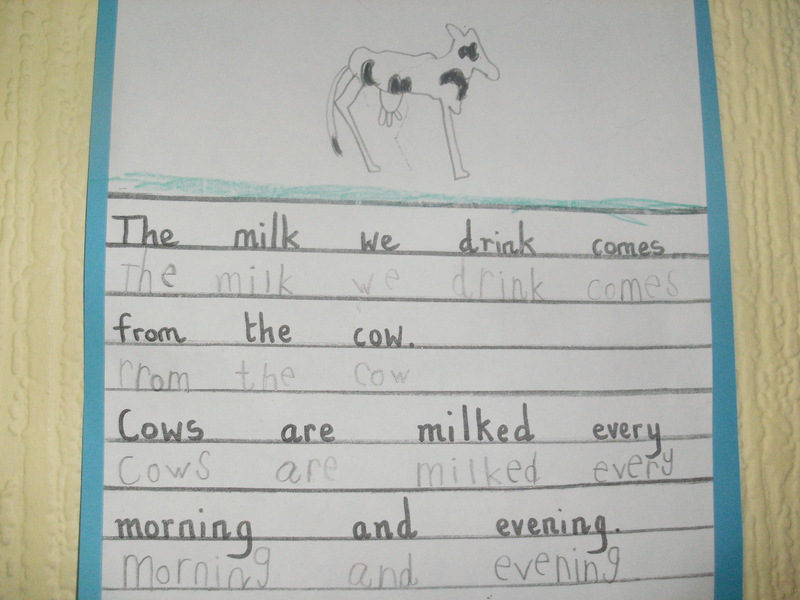 They practiced their handwriting cutting and drawing skills through various handwriting samples on the theme. 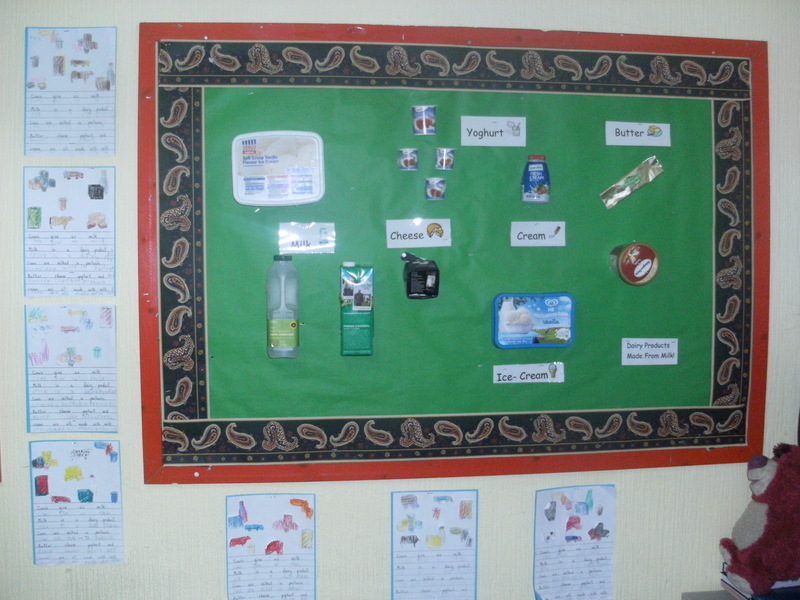 The budding scientists then collated and classified various food packaging to produce another display of dairy products commonly found in our diet. 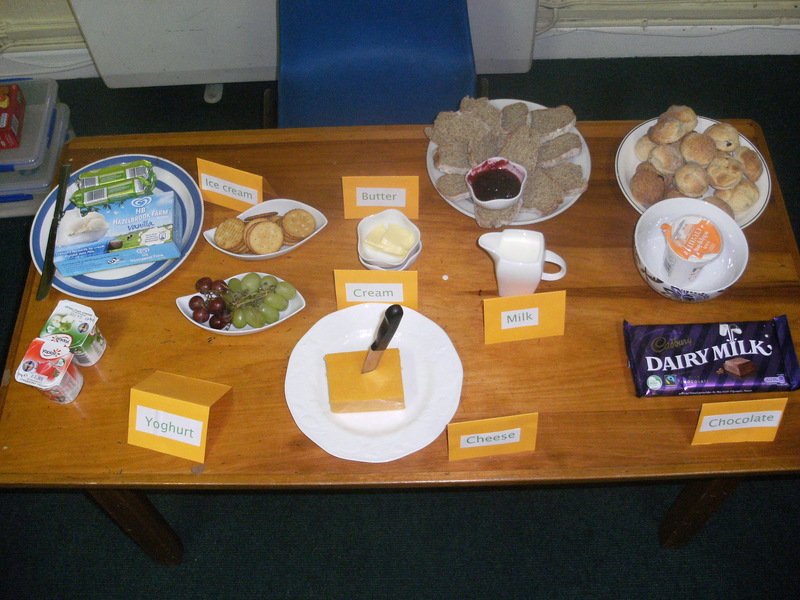 But by far the highlight of the Dairy Food Project was the tasting morning. 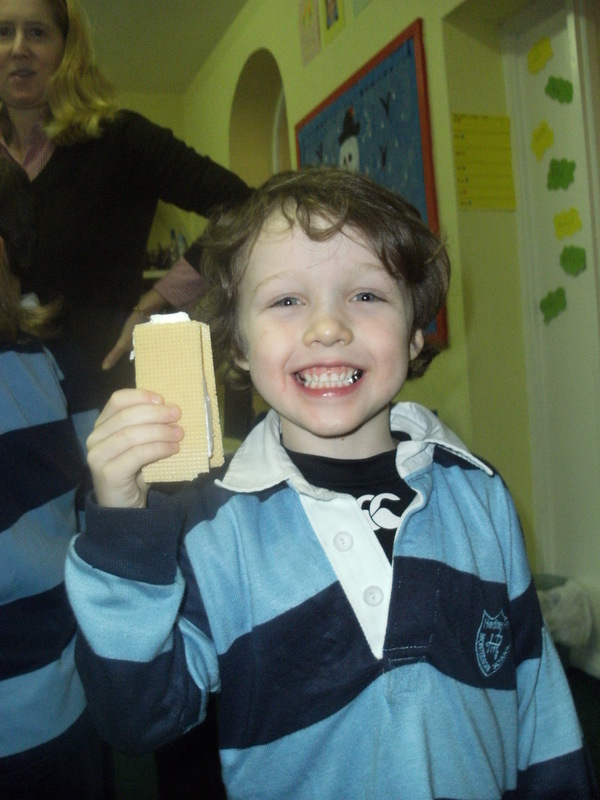 Using their senses of smell, taste and touch the children sampled various dairy foods and classified them according to sweet, savoury, bitter, hard, soft, cold and warm. Discussing their experiences of the foods in the group added to their vocabulary store, allowing the students to learn new ways of communicating the food experience to each other. 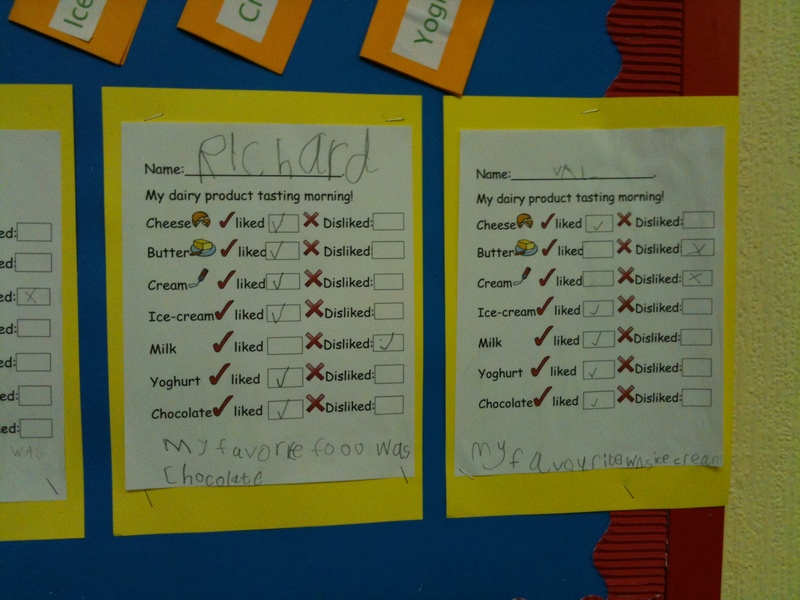 They then filled in their “likes and dislikes” to record the morning’s activity. 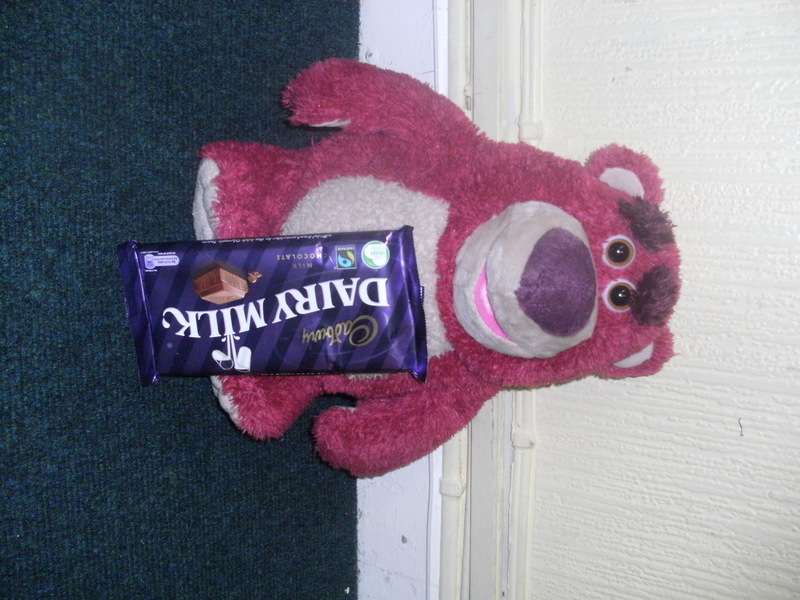 We all know which dairy food our friend “Lots’o Huggin Bear” liked! 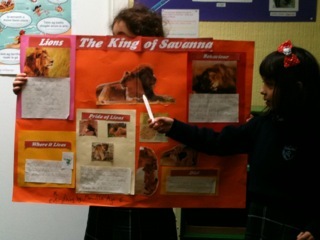 Lots’o Thanks from Senior Infants for reading all about their project.